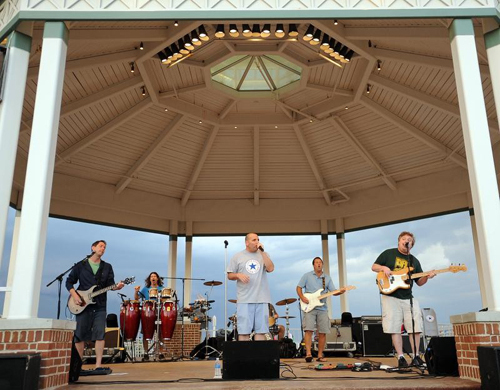 Love Seed Mama Jump is a six-piece rock band from Dewey Beach, Delaware. Their music is described as guitar-driven pop rock — a blend of modern beats and melodic hooks delivered with powerful, impassioned vocals. LSMJ has released 5 CD’s and sold over 100,000 copies independently. Their music has been featured on MTV, ESPN, ABC, and Microsoft’s X-Box Project Gotham Racing video game. With a reputation as one of the most energetic and engaging live shows on the East Coast, Love Seed has earned the title of “The Official Rock Band of the Washington Redskins” and play at FedEx Field after every home Redskins game. The band has shared the stage with such notable acts as Dave Matthews, The Beach Boys, Beck, Matchbox-20 and Fuel and the B-52’s, to name a few. Through hard work and a do-it-yourself attitude, Love Seed continues to entertain fans far and wide with their novel brand of high-energy rock and roll. Love Seed Mama Jump has performed at thousands of Nightclub shows and over 500 Weddings, Corporate Events, Fundraisers and College/Universities.